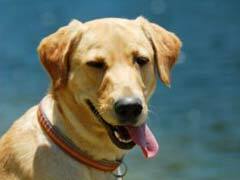 Panting is a natural behavior for dogs, and an important part of their biological process. Unlike humans, dogs have very few sweat glands, and panting is their way of regulating their body temperature. Dogs also pant after normal exercise, or even when under stress. A puppy in a new home is likely to pant a great deal, but this should gradually subside. However, excessive panting in dogs can be an indications of serious problems, some potentially fatal. Dogs often pant when ill or injured, in addition to when they’re well. Panting can signify the onset of heat stroke, which very rapidly can lead to brain damage or death, or other illnesses such as myasthenia gravis, an immune disorder that affects the muscles, canine Cushing’s disease, or even heart degeneration. It’s important to watch carefully when you notice heavy breathing. The most important step to being able to tell the difference between a dog panting excessively and one who isn’t is knowing how a healthy dog sounds. This varies from dog to dog, so make sure to learn what is normal for your individual pet. The best way of doing this is to simply make note on your dog’s behavior and observe its natural breathing, both when it is at rest and when it is exercising. When attempting to discern sick dog symptoms, first make sure that there are no obvious reasons for your dog’s panting—such as nervousness, heat, or having just gone through strenuous activity. If the answer is no, watch for some long term signs: diarrhea, weight loss, loss of appetite, fatigue, or excessive drinking in dogs can also be signs of greater issues. Also, excessive panting in dogs can happen when a dog is choking, poisoned, or injured. Has the dog just finished a meal? If the dog is choking, the heavy panting will more than likely be accompanied by hacking or an attempt to vomit. Has the dog just been outside, where it may have ingested something toxic? If this is possible, look for other signals such as shaking or heavy drooling. Check your dog’s gums for any bluish discoloration, as this can signify an internal injury of some kind, and can explain why your dog is panting strongly. This may also be a sign that your dog is fighting illness. Excessive panting in dogs can indicate a fever, especially if the dog is resting while panting. Check the dog’s temperature, and if it is over 102.5°F then take your dog to a vet for a check up. Of course, the most qualified person to make a dog illness diagnosis is your veterinarian. If you notice one or more signals that something may be wrong with your pet, speak to your veterinarian. While some problems may seem obvious, others such as respiratory, heart, or neurologic disorders may need a professional eye to discern. Again, the most important first step in noticing excessive panting in dogs is to keep a careful eye on the dog’s normal behavior. Do this, and you’ll be more prepared to notice when something is genuinely wrong.